You are experiencing signs and/or symptoms which you believe indicates that you are becoming ill and you want to stop the illness process. You are already ill and you are not getting the results you want from your doctor. You are well and you want to either prevent becoming ill in the future. You want to know how can you prevent illness before it happens to you. You are already ill, and want to learn to work with your body’s natural healing ability without expensive, painful or dangerous medical treatments. The Lawrences take you on a step-by-step journey illustrating each of the roles your mind, your body and your spirit play in creating and healing illness. Find out what you need to know to protect yourself from Stress-Related Disorders. Learn what stress really is and how and why it affects you and what you can do about it. Recent studies suggest that 70% to 80% of all illnesses seen in medical practice are caused by or worsened by stress. Illnesses caused by stress are called Stress-Related Disorders and are often missed by medical doctors. Stress is the number #1 Killer in our country today. Drs. Allen and Lisa Robyn Lawrence show you how stress can and does create illness. They clearly and concisely define steps, the symptoms, and how the process so that you can recognize what is happening to you and where you are in the process. Early recognition of stress and Stress-Related Disorders can lead to complete reversal of symptoms and illness and return to wellness. See how the your low self really works as it either protects you or leads you to stress-related illnesses. See how Huna works with a medical situation. To read more about Stress-Related Disorders, Illness: An Intelligent Act of the Body, click here. To Purchase Stress-Related Disorders, Illness: An Intelligent Act of the Body, click here. Premenstrual Syndrome (PMS) was one of the first of these health problems we treated working together. In the early 1980's we joined forces with Guy Abraham, M.D. 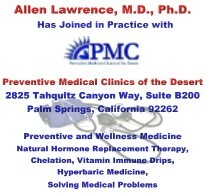 an Ob/Gyn Endocrinologist from UCLA Harbor General Hospital. Working along with Dr. Abraham and a team of five other medical doctors, all using Dr. Abraham’s proven work; it became very clear that PMS was in fact a nutritional deficiency syndrome that caused a hormonal imbalance. We treated several thousand women and had a very high success rate of helping them to eliminate their PMS symptoms through rebalancing the nutritional deficiency syndrome which caused their PMS. Through our understanding of the cause of their PMS, we were able to empower the women to reduce and often completely eliminate their PMS symptoms in as little as 30 days. This eye-opening experience lead to our first book, Special Report: A Doctors Proven Nutritional Program for Conquering PMS published by Simon & Schuster, Prentice Hall in 1992. In 2001 we updated and modernized this book and renamed it 30-Days to No More PMS. Our most recent version of 30-Days to No More PMS along with our 30-DaysTo No More PMS, The Cookbook is currently available in e-book formats from ALLCO Medical Publishing. To read more about 30-Days To No More PMS, click here. To purchase 30-Days To No More PMS, click here. To purchase 30-Days To No More PMS, The Cookbook, click here. If you are one of the twenty million women, men or children who suffer from Iron deficiency Anemia (IDA) or if you are pregnant and do not want to have to take iron supplements then you will want to read Drs. Allen and Lisa Robyn Lawrence book 30-Days To No More IDA, A Doctor's Proven Nutritional Program. This book will tell you exactly how you can become symptom free in as little as 30 to 90 days and how you can keep your self symptoms free and healthy for the rest of your life. You will have No More problems with IDA. To order our e-book version of 30 Days To No More IDA, A Doctor's Proven Nutritional Program, click here. Another book you may be interested in is Huna and the Future of Medicine, Integrating Huna and Western Medicine So They Work For You. The current health care system has some very big problems. The cost of medical care is too high and it there is no system for prevention of illness. Physicians are unhappy and the general public is unhappy and worst of all there are no apparent solutions on the horizon. In their book Huna and the Future of Medicine, Integrating Huna and Western Medicine So They Work For You the Lawrences look at how the ancient Hawaiian-Polynesian healing system, Huna for some new answers. Using this ancient healing system the Lawrence describe how it can be used today to create a new and fresh approach for those who are ill or are becoming ill and desire to become well again. They show you how you can maximize the benefits of the Western medical system while maximizing their own self-help abilities to help your self. In Book #1, Huna Prayer, The Hidden Code Of The Bible, Using Huna Prayer To Ask For And Get Everything You Want, introduces an exceptionally valuable ancient method of prayer. In this first book we look at the relationship between Christian prayer as instructed in the Bible and the use of Huna prayers as described by Huna masters. Today, medical studies clearly demonstrate that there can be great benefits from the use of prayer for healing and wellness. Most people pray for two reasons: First as a sign of respect for God, and two, as a way of asking for what they want, need or desire. In this book we look at Jesus and his disciples and how they discuss and talk about using Huna prayers. In this book we look at several simple ways to accomplish both of these goals at the same time. Huna Prayer is older than Christianity. It is introduced in both the Old and New Testaments of the Bible. It offers a little known Hidden code which can be used by everyone to ask for and get what we desire, to heal and to offer respect to God, and to your Higher Self. Huna Prayer is described by Jesus when he tells his disciples how they are to pray. Today, in the 21st Century you can learn how to use Huna Prayer and follow the Hidden Huna Code placed in the Bible by the ancients for your use. Since mankind’s first days on earth we have been spiritual beings. In the beginning we looked to the stars, and then to the gods of the earth and the heavens for help. Ancient man asked, and sometimes even begged, for assistance in his daily life. He asked for help in maintaining life, as well as finding sustenance, shelter and protection. Alone in what was often perceived as a hostile environment early man had only himself, his family and his prayers to nourish and protected him. Prayer soon became an important part of life, because without it, he had less. Over the millennia from first walking the earth until today, prayer has evolved from simply asking to asking in a way in which the intelligent Universe we live in wants us to profit and evolve. For early man, no evolution was higher and more important than through using Huna Prayers. For the first time in history humankind now had a tried and tested form of asking for what he desired, wanted and needed. In this book #2, Huna Prayer: Using Huna Prayer To Heal Your Self And Others, A Workbook for Building Huna Prayers, you can now learn to make your Huna prayers work for you. Huna Prayer is a tried and proven method for asking for and receiving what you most need and desire in life. Huna Prayer offers you the ability to make contact with your Creator, you Higher Self and recognize your connection to the Intelligent Universe we live in. This workbook teaches you how to create Huna Prayers which can bring you everything you ask for, want and need. In Book #3, Huna Prayer: Healing Yourself and Others Using Huna Prayer, we take you to a new level of capacity for constructing Huna Prayers in which you can now learn to construct and use Huna prayers to heal yourself and others. In the books #1 and #2 of this series, we laid down the vital groundwork by demonstrating how Jesus and the ancients used Huna Prayers in their daily life not only to bring them what they wanted and needed, but also to create miracles and to heal their parishioners. In Book#2 we provided a workbook to teach you how to create perfect Huna Prayers and to create them to give you everything you have always wanted and needed. Now in Book #3, Huna Prayer: Healing Yourself and Others Using Huna Prayer, we offer you the opportunity to use your own, personally created, Huna Prayers to heal yourself, members of your family, friends and even strangers, using the most sophisticated prayer ever known to mankind, Huna Prayers. Create and use healing Huna Prayers Heal yourself, and help loved ones, friends and even strangers heal themselves of most illnesses, even at a distance. Learn who you really are and understand the gift from the ancients of prayer, using Huna Prayers to enrich your life. By using Huna Prayer you can bring everything you have ever wanted simply by asking for it. Join us now on an adventure into learning about and using Huna Prayer for your own personal needs and to heal yourself and others.